I've had such a busy day today, we had to go and get my son a new car seat, and I had to change a couple of tops, so of course that turned into a full shopping session! We went to IKEA as well, which takes a day in itself! I announced my 30 follower giveaway yesterday and promised I'd have swatches of the polishes up tonight, so here they are! The holos are Catherine Arley 673 and 805. 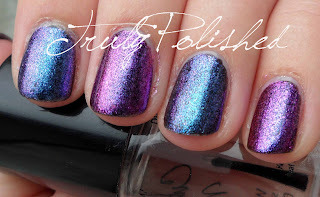 673 is a gorgeous grape purple with a scattered holo effect and 805 is a black with scattered holo. 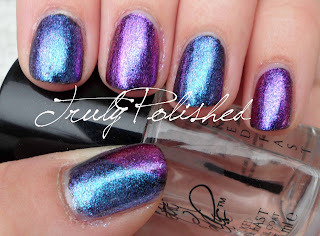 The holo effect in these is very similar to in A England polishes, where sometimes it looks almost linear. The formula on both was really smooth, I used two coats for the black and three for the purple. The glass fleck polishes are Hedys Ma.Nish.Ma Blaster and Way Out Fuscia (their spelling, not mine...). Blaster is a purple/blue duochrome and Way Out Fuscia is a pink polish with a shift to blue, with orange at extreme angles. My photos show one coat of each layered over black. My index and ring fingers show Blaster, and I have Way Out Fuscia on my middle and little fingers. My thumb shows half and half. I decided yesterday that seeing as I layered these polishes, that the prize would be incomplete without a black. So I will be adding a black to the prize! These means that the winner of this giveaway will win all four of the polishes shown above, with a black creme as well. It's worth mentioning that the polishes I swatched are my own, you'll be winning new, unused polishes! It's definitely worth joining to win this prize! As I mentioned yesterday the draw will be on Sunday 10th June at 12pm GMT.